Discussion in 'My Favorite Mods, Tips, Tricks (and Blunders!)' started by GrizzlyGirl, Jun 8, 2010. GrizzlyGirl Too many to count! So my new pup has those hooks in the ceiling for a hanging pantry and a hanging wardrobe. Looked at the ones you buy from the dealership and way too expensive! OK maybe if they were built to last and weren't so flimsy I would have bought them. But they sag with weight and don't offer many options. So I figured there had to be something better I could do and started researching on-line and came across someone else's great idea! Wish I could claim this one as my own but I did use different components that I felt would work a little bit better. So here it is. 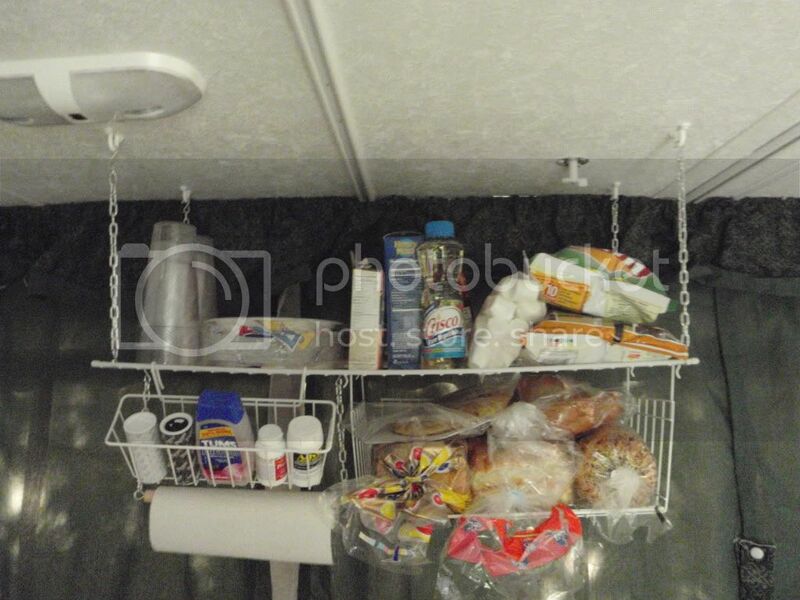 I figure that the basket underneath will hold the bread, hamburger/hotdog buns, bagels, etc. The small basket hanging off the front can hold the salt/pepper, advil, tylenol...small stuff I want within easy reach. 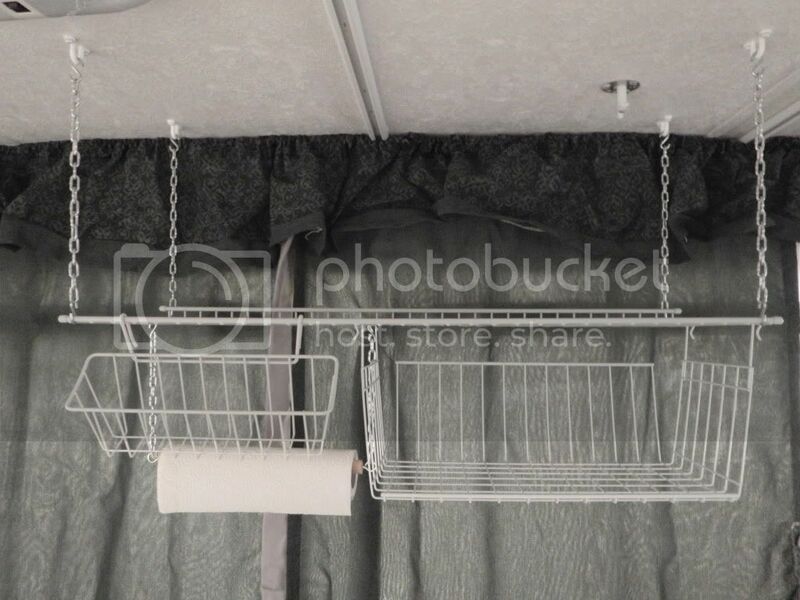 The main shelf will probably house the cereal, chips, snacks and anything else I can think of that won't put too much weight on since I can't seem to find in the manual how much weight the ceiling hooks are meant to hold. All in all this probably cost me $40 to make. Keep in mind, I'm in Canada so it cost more then at Home Depot in the states. I figure that if I had of picked up the materials when I went to Bar Harbor it would have come out more around $25 - $30. 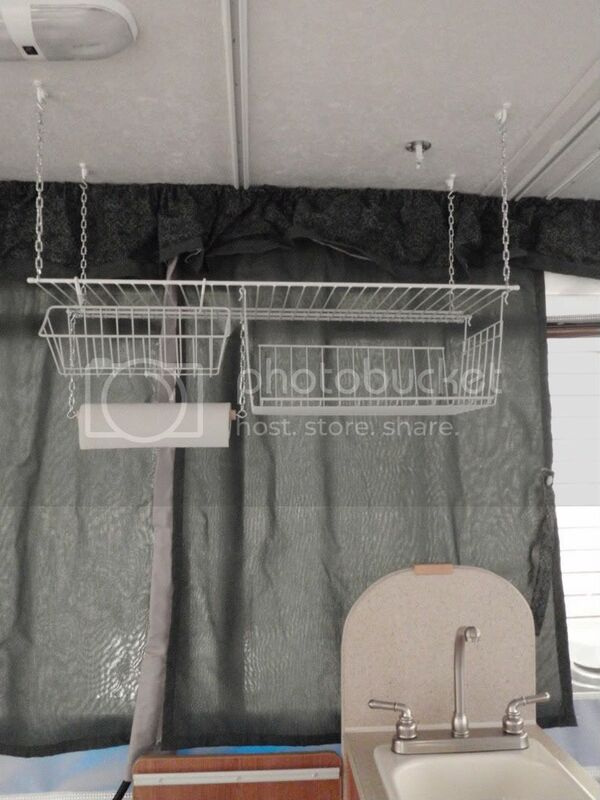 MUCH less expensive as the hanging pantry at the RV dealership and MUCH better quality. Next will be doing something where the hanging wardrobe would go. I'll post more pics once it is loaded up. That's a good looking mod. I did somewhat the same thing. We have 3 baskets that hang down from the hooks. 1 shallow on top and two deep ones underneath. We also have a mod the first owner made for over the sink. It is the right size that when we pull the stove/sink outside we don't hit our heads if we use the area as a seat or storage. Nice.. can I ask what size screws and anchors (if any) you used?? I have a Pal. as well and have no idea what is up there in the roof to attach things to. Also the DW wouldn't be too happy if I accidently put a screw right through. My pup came with the hooks already there. I wouldn't dare put a screw into my roof.....with my luck I'm sure I'd hit something! Very nice. I saw a set up very similar to this over the weekend only outside the camper. They anchored the chains to small eye bolts that were secured to the to the underside of the bunks. very nice easy mod you did, good job! Very similar to the two I have. Two 5' sections, one over the couch and one over the table. At first I tried to modify coat hangers as the hanging rods but I found the chain is alot easier to hang. And here is the shelf all loaded up. And it could have taken more no problem. I love it very nice job!